Notice the xmlns:datacontrols declaration at the top. Now since we can’t do the grouping declaratively as in my previous sample with Silverlight 3 beta, here’s how we could do it. In Silverlight 3 you have access to PagedCollectionView (add a reference to System.Windows.Data to get it). 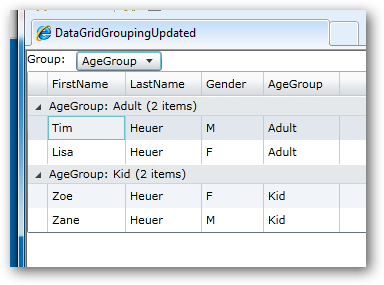 This is a view that enables you to add sort and group descriptors. In my initial loading code I instantiate a new PagedCollectionView passing in my List<Person> as the enumerable type. I then set a default grouping on it. 6:         // adding additional groupings.